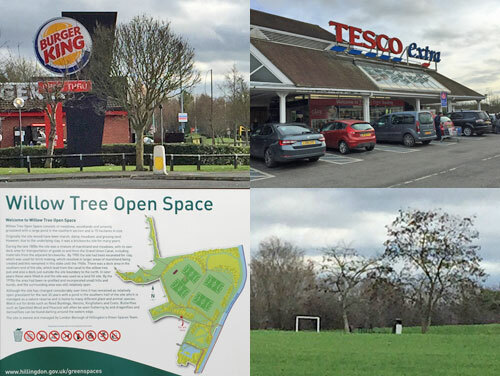 Yeading (pronounced Yedding) is undeniably one of London's lesser known suburbs. It's hidden away on the eastern edge of the London borough of Hillingdon, rubbing up against Ealing, roughly halfway between Hayes and Northolt. Drivers miss it because it's sandwiched between the Uxbridge Road and the A40. The Grand Union Canal splits it off from Greenford, so driving in that way doesn't work either. It's never had a station because no railway goes within a mile of the place. I'd never been, other than straight through on a bus, so I've rectified that and today present a post which namechecks Yeading no fewer than 36 times. 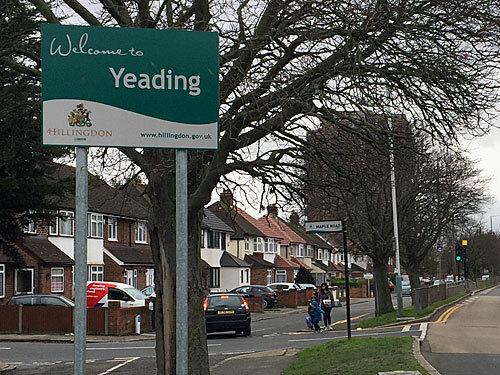 Yeading was a tiny village far longer than most, its first mention in the 8th century, and still a small huddle of cottages at the start of the 20th. 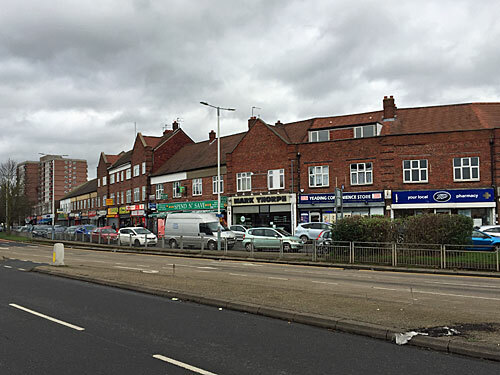 Development started creeping north from the Uxbridge Road in the 1930s and finally jumped the stream during the war. Yeading's unusual therefore as a late-developing suburb, which now sprawls in all sorts of directions covered by a variety of modern-ish housing. Tying down its boundaries isn't easy. TfL reckon it stretches as far north as the White Hart roundabout, even though every Ealing streetname confirms this area is still Northolt. Hillingdon council reckon it starts at the borough boundary, just south of Kingshill Avenue and continues only as far as the river. But they also insist on writing Hayes on all the local streetname signs instead (apart from a very select few which inexplicably say Yeading, in very disparate locations, and basically this is all terribly confusingly vague). Maps from 100 years ago show an isolated country lane threading across a patchwork of fields to connect the hamlet of Yeading to the rest of Middlesex. That lonely track is now Yeading Lane, a busy local corridor, and the spine road for most of the postwar development. The original village centre lay around the big crossroads, where not a single original building survives. Instead a typically-bricky shopping parade sweeps down one flank, boasting insufficient parking and a lowly bevy of shops. I'm impressed it still has a Boots, and somehow still an independent men's, children's and ladieswear emporium called Vicky's. The fruit and vegetables arrayed in boxes outside Mor Foods look bountifully splendid. Retail categories featuring twice along the parade include betting shops, fried chicken vendors and Polski skleps. The furniture store spells Sofa's with an apostrophe but not Tables, Chairs, Beds or Wardrobes. 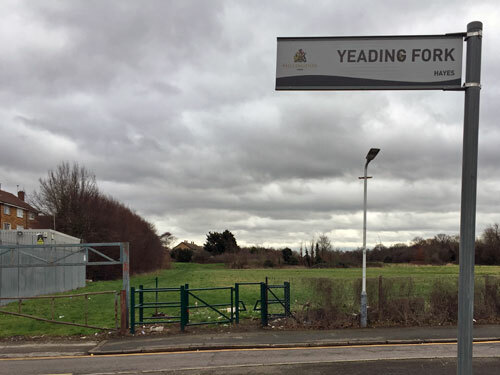 Although it sounds like a posh restaurant, or perhaps some kind of farming implement, Yeading Fork is just a road. This short spur used to be the route by which the country lane entered the village, winding round Manor Farm and a water pump, but it was bypassed early last century to give through traffic a clearer run. At one end are a scrap metal yard and a bus stand, and at the other end a corrugated iron hut with a cross on top. Yeading wasn't initially large enough to merit a church of its own, so this hut does for the Apostolic lot... while the C of E gained St Edmunds down the lane in 1961 with its fire-station-like tower and colourful stained glass. If anything in Yeading is an attraction it's probably those windows, but only if you can get inside the building. That river I've been mentioning is the Yeading Brook, one of west London's more significant streams, which feeds into the River Crane south of the Grand Union Canal. I've long wondered why a 10 mile river rising near Harrow should be named after this insignificant suburb, but checking an old map confirms that the hamlet of Yeading was the only settlement near its banks amidst a broad sweep of meadows. They survive here as Yeading Brook Meadows, a lengthy stretch of grassland still cultivated for hay, which divides definitely-Yeading to the north from possibly-Yeading to the south. The rare narrow-leaved water-dropwort grows here if you know where to look, as do the common spotted-orchid and the crack willow, while the sign by the footbridge promises kingfishers too. At this time of year it's more an expanse to rush round with the dog, well-wrapped, but I imagine it comes into its own in the summer. When I finally get round to walking the Yeading Brook end to end, I shall tell you more. 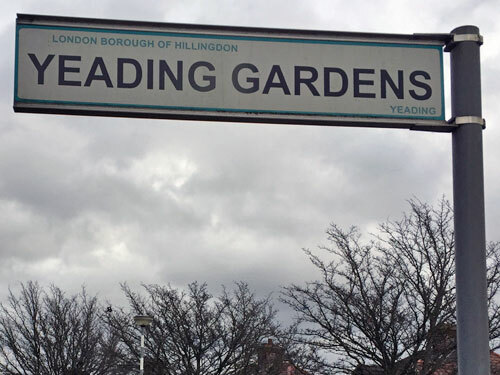 Across the Yeading Brook, in what might not be Yeading, lies Yeading Library. 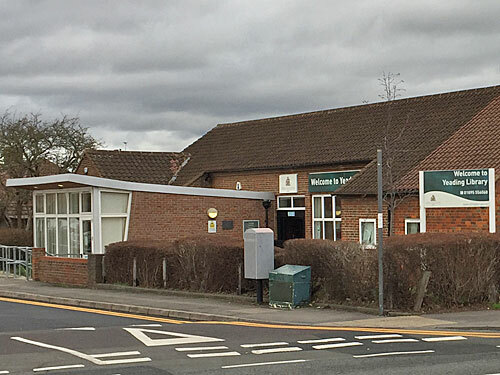 It looks like a village hall with two conservatories trumpeting out at right angles, and is accessed down a short ramp past a minor flowerbed. Impressively it still opens six days a week, and somehow hasn't yet been rebranded Yeading Reading despite that being the obvious thing to do. 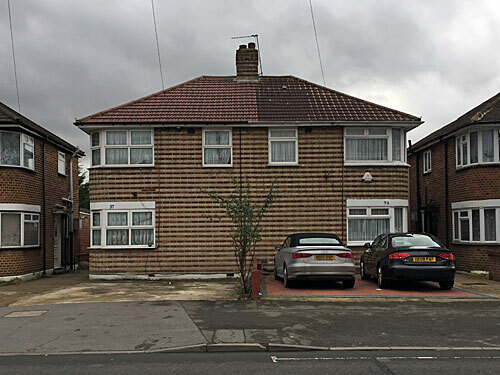 I found it on the corner of Yeading Lane and Yeading Gardens, amid one of the area's earliest estates, where I spotted several bungalows, a lot of paved driveways and one of the ugliest semi-detached houses I have ever seen. The ground floor windows only cling to the outer corners, leaving a brutally blank expanse in the centre, and the walls are built from two-colours of brick layered like a chocolate wafer. You see this brick design on certain other houses nearby, where the developers tried adding variety amidst plain, plastered and pebbledashed, but thank goodness it never caught on. Because Yeading Lane could never cope with serious traffic, a dual carriageway called The Parkway was carved through some years back. Beyond the Willow Tree Roundabout is car country - a massive retail park with several hundred parking spaces plus a Driver and Vehicle Standards Agency hub where would-be drivers take their tests. Queues of weekend shoppers first pass a choice of Burger King or Starbucks drivethrus, then a huge B&Q, then an even huger Tesco. I manoeuvred inside the Yeading Extra to use the loo, decided against fish and chips from the short parade piggybacked outside, then set off into a meandering hinterland of 1980s townhouses. Yeading really does boast some impressively unremarkable residential variety. 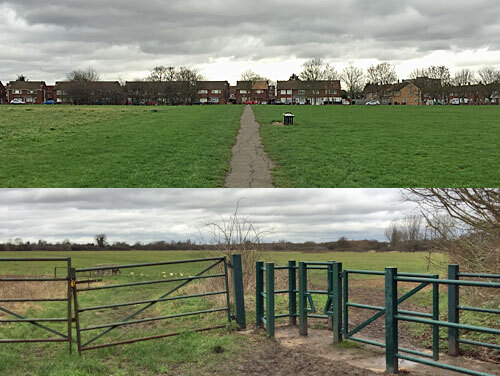 Eventually I found a cut-through to Willow Tree Open Space, transformed from brickworks to nature reserve and sports pitches fifty years ago, and wandered past littered thickets and empty playgrounds to the Grand Union Canal. Yeading definitely ends here. As a postscript I crossed the Uxbridge Road to what definitely isn't Yeading to where Yeading FC, who no longer exist, no longer play. They used to be big, for non-leaguers, climbing the Isthmian League to reach Conference South, and with two big FA Cup ties under their belts against Newcastle United (2004) and Nottingham Forest (2006). But in 2007 they decided to merge with their neighbours to form Hayes and Yeading FC, enduring less success and a lengthy ground-sharing safari. Only last season did they return to The Warren, now rebranded the SKYex Community Stadium, which is tucked away at the back end of a trading estate behind several carpet warehouses and a Sikh academy. You'll know the original ground from Bend It Like Beckham, where it was used for most of the training scenes and matches, with the Southall gasholder rising in the background. Expect Hertford Town at home next Saturday, in the Bostick South Central, to be less of a performance.